Item # 303149 Stash Points: 2,495 (?) This is the number of points you get in The Zumiez Stash for purchasing this item. Stash points are redeemable for exclusive rewards only available to Zumiez Stash members. To redeem your points check out the rewards catalog on thestash.zumiez.com. Perfect for fans and collectors alike, Spacecraft presents the PBR Blue Pom Beanie. This warm knit accessory features Pabst Blue Ribbon logo script on the crown while a signature logo patch is stitched on the fold-over cuff. PBR Blue Pom Beanie from Spacecraft. 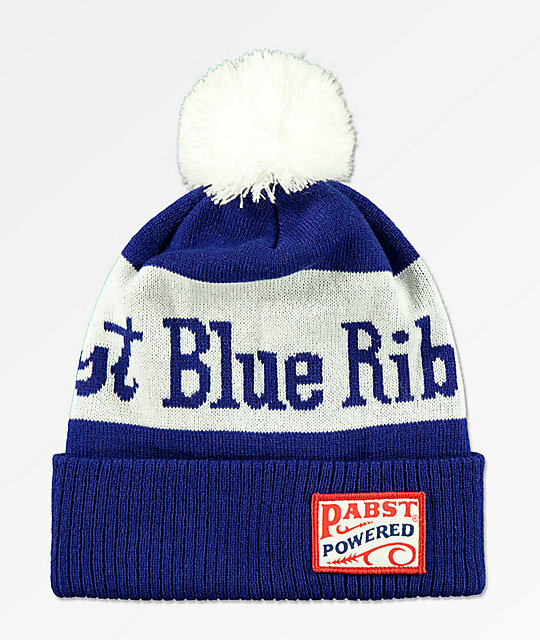 Fine knit construction with knit Pabst Blue Ribbon logo script on crown. PBR logo patch on fold-over cuff.